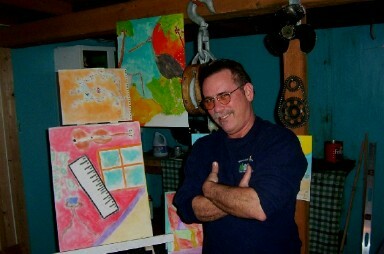 Craig has taken as many art classes as he could, starting in Junior High through High School. Drawing, painting, ceramics, and sculpture. Definitely his favorite subjects. He went to marine engineering school to get a "real" job to pay bills. Before he started sailing he moved to the northwest and worked for the forest service fighting fires, and also did some logging, bartending, etc. His true happiness comes from creating art. His job is all mechanical so he uses the other side of his brain every chance he gets. He prefers to paint first thing in the morning. He really digs a lot of color in his work. Some influences: Just about all the French Impressionists. But, he doesn't limit himself, he likes anything that's creative. If you have any questions for Craig about his art or him personally he may be reached via his email account. You may also contact his agent at this address.